We have a NEW OFFICE LOCATION!!! Still in North Scottsdale about a mile from the old place, we are now loacated on the Northwest corner of Pinnacle Peak and Pima, and Pinnacle Peak Roads (In the Citadel). Click on the spine to get a map and directions to my office. I believe in regular Chiropractic care, the highest quality in vitamin, mineral, and herbal supplementation, and whole body balance: through nutrition, exercise, and if necessary, therapeutic modalities, and Moszkito footbed orthotics and sandals. We staff a Licensed Massage Therapist, we offer Nutritional Counseling, Hair Mineral Analysis, Sonoran Quest Bloodwork, Sports Injury Specialization, Accident Injury Treatment and a full line of Pharmaceutical Grade supplements from Biotics Research, including: vitamins, minerals, herbs, and various natural, drug-free proprietary blends. In this way, patients may achieve optimal health through Chiropractic, nutrition and overall wellness. To better serve my patients, I have obtained a degree as a Certified Chiropractic Extremity Physician (C.C.E.P. 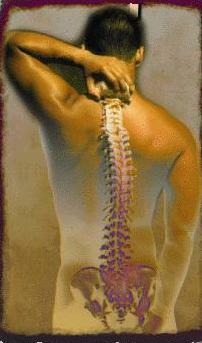 ), specializing in the treatment and maintenance on extremity injuries and joint rehabilitation. I am also certified in the practice of Iridology. An interesting assesment tool concentrating on the body's nerve reflexes within the iris of your eyes. With Chiropractic, you'll be able to achieve and maintain your body's highest level of health, allowing you freedom from dis-ease. If you're not in an optimal phase of health, let us help you restore it. If you feel that you are, let us help you maintain it. Hopefully, this site will enhance the available information for those curious about Chiropractic, and will better educate them with what occurs in a Chiropractor's office. There is a plethora of information within this site including: links, news articles, etc. These links will provide you with easy access to web pages concerning: state by state licensure, the many varied techniques, our unique philosophy, and much, much more, for instance, the interesting history of our profession, now over a hundred years old. Visit our office today, or call to schedule an appointment at 480.342.9191. Chiropractic works, and it IS the right choice for you. Please allow me to serve you with the natural healing arts. Our patients rest assured, knowing that we provide the highest quality pharmaceutical supplements, because we use Biotics Research products. They have a line of vitamins and minerals, recognized world wide for unequaled performance and bio-availability. The local office for Biotics Products is DSD International in Phoenix. My patients, ALL OVER THE U.S., can simply call the toll free number and tell DSD I am their physician, and DSD will send any of the amazing Biotics products right to their door, and they don't have to use me as a middle man. These supplements are the best on the market. I don't carry multi-level-marketing or Network junk vitamins in my office, so you don't have to worry about quality here, these are efficient, bioavailable, and of high potency. You must be a healthcare provider or a patient to get these, so trust me when I tell you, they are the best. If you would like to order Biotics Research products, please call 1-800-232-3183 and when you tell them you are a patient of mine and you can order anything on their Product Line (Click image to view) and have it shipped straight to your home, just as I could. Enjoy the Best! Dr. Chris M. McDaniel, D.C., C.C.E.P.